Breaking out bottles and jars of creams and lotions for winter. In the cold, my skin can’t get enough of moisturizers. Growing up in Hawai’i I never used cream – there was always enough moisture in the air. Seriously paradise. Here in NYC I slather it on when the temperature dips below 60F. Legs, neck, arms, and all in the middle. Otherwise, dry skin in a day. No wonder they say people age faster on the east coast. Kiehl’s Crème de Corps is a lifesaver and a staple. One big jar, we store it on the nightstand. Smother on at night and in the morning. It’s a decadent feeling, whipped body cream made with soy milk and honey. Sinks right into your skin, no oily feel. Now you realize. It’s never just about the cream/lotion. It’s also about the packaging and design. Cannot emphasize how important the packaging is. Bonus point and sways for containers and clever vessels that come easy on the eyes. Hello Tocca. This Italian brand is best known for their amazing candles, but the creams and lotions deserve just as much attention. I’m working my way though this glass jar of Florence Crema Da Sogno, the Orris Rose scent at the moment, but will move on to a different scent (maybe the Bianca – Green Tea and Lemon) after we finish this jar. They just opened a shop in the West Village and you can test out all the creams there before settling on a scent. Too hard to pick only one favorite! Tocca also does hand creams in cute little two-ounce squeeze bottles. The scents are too strong/girly for Pierres’ liking, but it’s perfect for myself. I buy them in a three-pack set, the “Crema Mani Viaggio.” The set includes a tube each of Cleopatra (grapefruit cucumber), Stella (blood orange), and Florence (Orris Rose). They also sell the three hand creams individually if you don’t like all the scents in the set. And for the days it’s extremely cold outside, I use a cream that really just coats you completely and thoroughly. But one that also leaves you feeling non-greasy and still light. 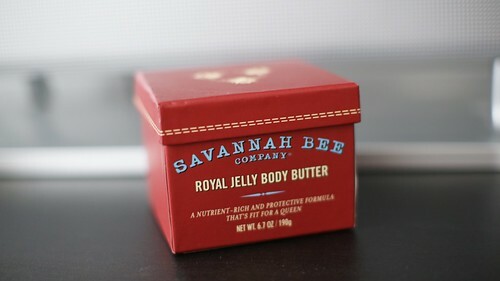 Enter the Royal Jelly Body Butter from Savannah Bee Company. I’m a fan of their honey and many people don’t know they also have a line of beauty products (it’s not only food!) Lightly scented soap, body and lip balms. …don’t even get me started on face creams, heheh. We’ll touch that subject next time! …I can imagine doing on an October day where we get rain, snow, sleet, and thunder. All at the same time. Did you see this photo of Washington Square Park in the NYT? That’s exactly what it looked like when we walked though the park this afternoon. 1. Early dinner at Babbo. First time in history we’ve stroll in for two corner bar seats with zero wait time. A decadent dish of Warm Lamb’s Tongue followed by Gnocchi with Braised Oxtail and Lamb Chops. Winter food. Two glasses of wine, one cocktail. 2. An evening at home with hot chocolate on the stove. I wrote about La Maison du Chocolat’s Tasse de Chocolat on Serious Eats. One of my favorite hot chocolates for good reason. These silky dark chocolate pearls are just as fine whisked and melted in hot whole milk and cream as it is straight up for snacking. Drink up in little espresso cups. Precious. Too decadent for anything bigger. Late Friday afternoon at Le Gamin. I love these tea mugs, don’t you? …Le Pain Quotidien, saucer-less but still adorable. This week we ate golden canelés from Petrossian…a good one is almost impossible to find in NYC, so take note. Tons of pumpkin desserts, including a top ten round-up for the season. Can’t miss the pumpkin doughnuts in cake and yeast form at the Doughnut Plant. Speaking of Doughnut Plant, they recently introduced fresh nut milks…think raw pistachios and cashews. Each milk is scented with different spices (cinnamon, nutmeg) and they are heavenly. Pies, apples tarts, and earl grey cupcakes, enjoy! Forgive me while we venture off the subject of food for a second, but something else has consumed my mind. Facial sprays, facial mists, facial waters. It is technically food…but for the skin. Ahaha. I’ve always been a little nuts for sprays. There’s something rather nice about carrying a tiny bottle of elixir in your purse…this is magic, this shall hydrate me to youth. Whether it actually works or not, I love the idea of spraying a potion on your face. Hold the bottle six inches away…that’s the perfect distance. Press down, and out releases a cool dreamy mist. Some are scented and some are not. I could go either way. Little travel size bottles of Evian always come with me on the plane. It’s the most basic of facial hydration mists…and you have to love the packaging. Some people poo pah the sprays: it’s water – why don’t you just wash your face?! You know who you are. And for you I whisk out the Moisture Bound Skin Energy Hydration Delivery System from AmorePacific. The name is so long, but the faint sweet scent is addictive. Inside…no water but bamboo sap. Pure stabilized bamboo sap and not a touch of water. The mist feels slightly thicker (almost like a clear liquid spray lotion) than other water-based sprays. AmorePacific thoughtfully puts a reflective sticker on the cap of each bottle – that “mirror” has come in handy more than once. And then of courses, there’s my collection of rose waters. I bottle the Mymoné and Nielsen-Massey rose water in empty Jurique bottles just because those don’t come with spritzer caps. Store in the fridge and I use these for not only my face but the entire body right after I shower. It is…how do you say? Ahh right, heaven.